The Six of Cups has overcome the crisis of the Five, it has learned and accepted its lesson. Tiphareth is the center, standing for beauty and harmony, the realization of consciousness. The 6 as the number of completion solves the imbalance of the 5, it combines the contrasts and reconciles the opposites. The 6 is open to all directions. 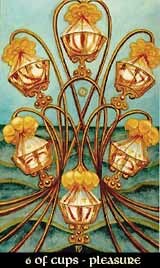 So the Six of Cups will tell of deep emotions, that have passed the depths of pain and fear and therefore will enjoy the pleasures of harmony and devotion more than ever before.